Because of the outrageous preparations by imperialist powers for yet another world war, next time almost certainly involving nuclear weapons and other weapons of mass destruction, and because of the arrogance and recklessness with which these imperialist powers operate, there have already been a number of very close calls where all-out nuclear war could have easily begun. The most famous of these was the Cuban Missile Crisis of 1962 in which the U.S. was determined to start such a war if Khrushchev did not back down about stationing nuclear-armed ballistic missiles in Cuba (in the same way that the U.S. had already done in Turkey and aimed at the USSR). There were other very tense political periods during the Cold War as well, and serious considerations by the U.S. about using nuclear weapons in Vietnam and against China in both the Korean and Vietnam Wars. Although the old Cold War ended with the collapse of the state-capitalist Soviet Union in 1991, a new Cold War is now gradually building up, this time between the U.S. again and China (or a possible alliance of China with Russia). The world will be very lucky indeed if an inter-imperialist world war involving the extensive use of nuclear weapons does not occur in the 21st century. Capitalist-imperialism continues to be a very dangerous threat to the continued existence of humanity. “On November 9, 1979, a computer problem led NORAD (North American Aerospace Defense Command) to make a false report of an incoming full-scale Soviet attack on the United States. The USA made emergency retaliation preparations before data from early-warning radar systems showed that no attack had been launched. On September 26, 1983, the malfunctioning Soviet Oko nuclear early-warning system reported an incoming US missile strike. The report was correctly identified as a false alarm by the duty officer at the command center, Stanislav Petrov: a decision that has been credited with preventing thermonuclear war. It appears that a war would probably have fallen short of causing human extinction, even if it had been fought with the combined arsenals held by all the nuclear powers at the height of the Cold War, though it would have ruined civilization and caused unimaginable death and suffering. But bigger stockpiles might be accumulated in future arms races, or even deadlier weapons might be invented, or our models of the impacts of a nuclear Armageddon (particularly of the severity of the consequent nuclear winter) might be wrong.” —Nick Bostrom, Superintelligence (2014), p. 357 note 12. “The ‘button’ can also morph into a perverse temptation for an unstable leader. In 1974, during his impeachment proceedings, President Richard M. Nixon said to reporters: ‘I can go into my office and pick up the telephone and in 25 minutes, 70 million people will be dead.’ Worried about Nixon’s state of mind at the time, Defense Secretary James Schlesinger asked to be notified before any nuclear launch order from Nixon was executed.” —Editors, “Take Nukes Off a Short Fuse”, Scientific American, March 2017, p. 10. [During the Cold War] “Actions that were justified domestically as defensive were perceived by the other side to be hostile. In 1983, shaken by the Reagan administration’s belligerent military buildup, and misjudging the intent of a major NATO field exercise in West Germany called Able Archer, which included a practice run-up to nuclear war, the Soviet leadership under Yuri Andropov had very nearly launched a preemptive nuclear strike against the United States. Though it all but escaped public notice, the Able Archer incident was the Cuban Missile Crisis of its day. By the time Gorbachev came to power in 1985, both sides threatened each other with total and mutual annihilation. ‘If one country keeps building weapons while the other one doesn’t do a thing,’ Gorbachev told Richard Nixon in the summer of 1986, ‘the one that arms will not gain anything from it. The weaker party could just explode its nuclear stockpile, even on its its own territory, which would mean suicide for it and slow death for the opponent.’” —Richard Rhodes, The Twilight of the Bombs (2010), p. 5. [Speaking of the period after the collapse of the Soviet Union:] “While the threat of global nuclear war between two hostile superpowers had faded, the risk of regional nuclear war among nations with seemingly modest nuclear arsenals had intensified. A regional nuclear war between India and Pakistan, for example, would be unlikely to involve more than about one hundred Hiroshima-scale fifteen kiloton weapons, merely 1.5 megatons of total explosive force, less than the yield of many individual Soviet and U.S. hydrogen bombs. The primary destructive effect of nuclear weapons is mass fire, however, and with highly combustable South Asian megacities as the likeliest targets, such a nuclear exchange would kill between three million and sixteen million people. Smoke from mass fires would loft into the stratosphere, drift around the world, and darken and chill the earth for a decade, reducing global average temperatures below those of the European Little Ice Age of the sixteenth to mid-nineteenth centuries, when crops failed and millions starved. Even a ‘small’ regional nuclear war, that is, would be an unmitigated disaster for the entire world.” —Richard Rhodes, Twilight of the Bombs (2010), p. 8. “The complete banning and destruction of nuclear weapons is an important task in the struggle to defend world peace. We must do our utmost to this end. “Nuclear weapons are unprecidentedly destructive, which is why for more than a decade now the U.S. imperialists have been pursuing their policy of nuclear blackmail in order to realize their ambition of enslaving the people of all countries and dominating the world. “But when the imperialists threaten other countries with nuclear weapons, they subject the people in their own country to the same threat, thus arousing them against nuclear weapons and against the imperialist policies of aggression and war. At the same time, in their vain hope of destroying their opponents with nuclear weapons, the imperialists are in fact subjecting themselves to the danger of being destroyed. “The possibility of banning nuclear weapons does indeed exist. However, if the imperialists are forced to accept an agreement to ban nuclear weapons, it decidedly will not be because of their ‘love for humanity’ but because of the pressure of the people of all countries and for the sake of their own vital interests.” —A Proposal Concerning the General Line of the International Communist Movement: The letter of the Central Committee of the Communist Party of China in reply to the letter of the Central Committee of the Communist Party of the Soviet Union of March 30, 1963 (Peking: Foreign Languages Press, 1963), p. 32. “Japan was already defeated... It was’t necessary to hit them with that awful thing.” —Dwight D. Eisenhower, speaking of the U.S. atomic attack on Japan at the close of the war. Quoted in the San Francisco Examiner, Aug 5, 1990, p. D-15. “Truman listened carefully to [Secretary of State James F.] Byrnes’s advice. At about the date of Byrnes’s appointment, the new secretary told Truman that (these are Truman’s words) ‘in his belief the atomic bomb might well put us in a position to dictate our own terms at the end of the war.’ Later, in May 1945, during a White House meeting at which the nuclear physicist Leo Szilard was present, Byrnes, according to Szilard, ‘did not argue that it was necessary to use the bomb against the cities of Japan in order to win the war. Mr. Byrnes’ view [was] that our possessing and demonstrating the bomb would make Russia more manageable in Europe.’” —Robert Smith Thompson, The Eagle Triumphant: How America Took Over the British Empire (2004), p. 311. “As later testimony revealed, the Soviet nuclear arsenal was never at risk during the coup [i.e., the attemped old guard coup against Gorbachev in 1991], thanks partly to what the American command-and-control expert Bruce Blair called its ‘ingenious’ design. Blair ... told a Senate subcommittee a month after the coup that the Soviet system’s safeguards ‘are more stringent than those of any other nuclear power, including the United States. The overall design of Soviet nuclear command and control is ingenious and its designers were deservedly awarded Lenin prizes for their efforts.’ Blair and his Soviet counterpart, command-and-control expert Gennadi Pavlov, explained to the subcommittee in some detail how the Soviet system worked. “‘We do not invest any authority to use nuclear weapons in a single individual,’ Pavlov began, ‘in contrast with the United States.’ In the American system, the president acting by himself can key the order to alert and launch nuclear weapons. The Soviet system was multileveled, with built-in checks and balances. At the leadership level it was a four-key system; the president, the minister of defense, and the chief of the general staff accounted for three Chegets [authorizing computer terminals], and any one of the three commanders in chief of Soviet strategic forces (the strategic rocket forces, the Air Force, or the Navy) accounted for the fourth. The three top leaders, their Chegets linked through the Kavkaz national-leadership network, had to act together to generate one combined code. That code in turn had to be combined with a code keyed into the system down the line by at least one of the three commanders in chief (CICs). A concurring CIC could authorize the alerting of only his own forces in concert with the top leadership. If he decided not to do so, then no authorization code would be generated for those forces.” —Richard Rhodes, Twilight of the Bombs (2010), pp. 92-93. As of 2016 nine countries in the world possess a total of over 15,000 nuclear warheads. The United States and Russia have 93 percent of them. Although this is down from the vast numbers possessed by the two powers in the late 1980s—around 60,000 in total at that time—there are still more than enough such weapons to destroy human civilization if not wipe out humanity entirely. And of course many more such weapons can be quickly made during any developing political crisis. 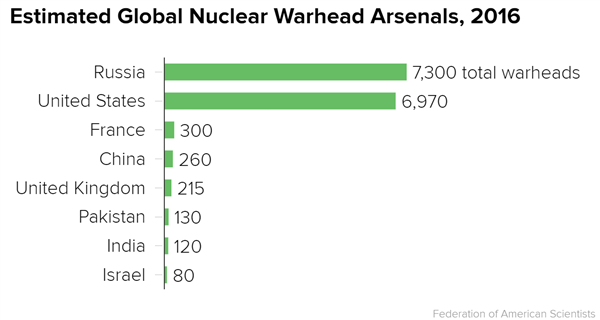 The chart at the right from the NBC News website at http://www.nbcnews.com/news/world/fact-sheet-who-has-nuclear-weapons-how-many-do-they-n548481 shows the number of warheads for 8 of the countries. North Korea also has a small number of nuclear weapons, perhaps as many as 25, though it has not yet demonstrated the ability to mount them on reliable missile delivery systems. Many other countries, including Japan and Germany, could very quickly produce nuclear weapons if they should choose to do so. In the modern technological era it is by no means as hard to make nuclear weapons as is often supposed. There are no real “secrets” to it; all the basic technical information necessary is available in books or on the Internet. It is mostly just a matter of engineering, and even that is no longer as difficult as is usually thought. Many countries have already acquired nuclear weapons, many others have at various times had programs which could have done so over time, and most of the rest of the countries of the world could create nuclear weapons if they were sufficiently determined to do so and had access to uranium (which is fairly widespread). For these reasons, humanity remains in a seriously perilous situation while nations (or even large well-funded political organizations) are motivated to acquire such weapons; i.e., as long as we remain in the capitalist-imperialist era. And far more serious even than the threat of new countries (or organizations) acquiring nuclear weapons is the continuing possession of many thousands of nuclear weapons by the major capitalist-imperialist countries themselves—none of which can be trusted one iota not to use them in one belligerent situation or another. “‘There was nothing there that you would not find in a high-school machine shop,’ Graham recalled. ‘They showed us the cases they used to move the weapons around, so we had an idea of their size; one would have easily fit in the back of a panel truck. ‘We built six weapons,’ they said, ‘and were working on a seventh when we shut the program down. Nobody knew about it. We never had more than one hundred fifty people involved, including the janitor. We spent twenty-five million dollars. We used gun-barrel technology so we didn’t need to test—we knew the weapons would work.’ They were showing us their operation, they said, because they wanted us to understand that if a country, or even a subnational group, can acquire the nuclear material, the rest is really easy. You don’t need an infrastructure. You just need a few skilled scientists and engineers and the HEU [highly-enriched uranium].’” —Richard Rhodes, The Twilight of the Bombs (2010), p. 210. Most nuclear powers, including China and the old Soviet Union, have promised that they will never be the first to use nuclear weapons and that if they use them at all it will only be in retaliation for the use of such weapons against them. The one country which has never promised this, is the United States. In fact, quite the contrary, the United States has often considered using such weapons first. Not only is the U.S. the only country to have actually used nuclear weapons (against Japan during World War II), they have seriously considered using them on several other occasions, including against China during the Vietnam War. During the early 1950s the U.S. even considered giving such weapons to France to use against the peasant-based Viet Minh in Vietnam. And at the present time, President Trump has threatened to use them first against North Korea. The American imperialists continue to threaten mass murder and genocide, even beyond the levels they engage in on a routine daily basis. “Foster further sweetened his argument by pointing out that a nuclear-based military strategy would help contain the growing costs of America’s ‘far-flung, extravagant’ defense complex that was threatening to bankrupt the nation. Instead of maintaining an expensive troop presence at every global flashpoint, Foster wrote, all the United States had to do was keep a ready finger on its nuclear trigger. “Even master of war Eisenhower was initially taken aback by Foster’s proposal for a ‘first-use’ nuclear strategy.... But Eisenhower did share Foster’s passionate anti-Communism. And the cost efficiencies of the massive retaliation strategy appealed to the budget-minded general, who was equally concerned about the growing burden of military spending on the economy. So began the reign of nuclear terror—or ‘brinksmanship’—that would hold the world in its grip for the next decade.” —David Talbot, Devil’s Chessboard: Allen Dulles, the CIA, and the Rise of America’s Secret Government (2015), pp. 201-2. “Foster seemed to have a chillingly remote perspective on what it means to drop a nuclear bomb. When the French garrison at Dien Bien Phu was on the verge of collapse, he offered to give two ‘A-bombs’ to French foreign minister Georges Bidault. The French official was deeply shaken by Foster’s blithe offer. Bidault responded ‘without having to do much thinking on the subject.’ He pointed out to Foster that ‘if those bombs are dropped near Dien Bien Phu, our side will suffer as much as the enemy.’ Likewise, during the Formosa Strait crisis, Foster was surprised to learn that the ‘precision’ nuclear bombing of Chinese targets that he was advocating would kill more than ten million civilians. Still, he was not chastened enough to stop his campaign to ‘punish’ the Chinese.” —David Talbot, ibid., pp. 244-5. The entry above on NUCLEAR WEAPONS—Current Arsenals provides information about the number of such weapons that countries have ready for use (as of 2016). However, over the past decades numerous other countries have also had programs to make such weapons. (Technologically it is not as difficult as is often supposed.) Most of these countries have been allies of U.S. imperialism, and—perhaps surprisingly to some people—the U.S. has generally opposed these programs in other countries, even allies, and in some cases has virtually forced its client states to abandon them. (A recent exception to this policy is the encouragement that President Trump has given to Japan to develop its own nuclear weapons.) Basically the U.S.—up to now, anyway—has wanted a world in which only it has nuclear weapons. The same can be said for all the other existing nuclear powers, including Russia, China, India, Pakistan and Israel. Where the U.S. and other imperialist powers cannot force other countries to give up nuclear weapons projects through intense economic and political pressure, they try to go further and institute all-out economic embargoes (which according to international law actually amount to acts of war). This is what the U.S. has been doing with North Korea and to a considerable degree with Iran (and is now threatening a major intensification of that pressure, or even military attacks there too). As with most imperialist politics the logic is completely flawed: No country with modern technology can really be kept from developing nuclear weapons if it is determined to do so. And as technology advances it actually gets easier and easier for countries to do this. Every advanced capitalist country that does not already have nuclear weapons could easily develop them in a very short period; in some cases (German and Japan) in a matter of just weeks. And even many far less technologically advanced countries (following the example of North Korea) could now develop such weapons in just a few years. The imperialist goal of keeping nuclear weapons out of the hands of growing numbers of countries cannot be permanently successful while captialist-imperialism continues to exist. The resort to technological embargoes to prevent this will inevitably fail eventually. Technological “solutions” to political problems are almost always failures in the end. “Despite their seemingly implacable differences, the two superpowers had worked both separately and jointly during the Cold War to limit nuclear proliferation, implicitly cooperating for common security. Their most significant cooperation drove the negotiation of the Nuclear Nonproliferation Treaty (NPT), opened for signature in 1968, which offered extensive security guarantees and the advantage of commercial nuclear power to countries willing to forgo acquiring nuclear arsenals; by 1990, 140 states had signed on. More than any other factor, the NPT had limited the proliferation of nuclear weapons across the world. “Actions had also been directed against specific states. In 1975 a threat by the United States to withdraw its military forces from the Korean Peninsula had compelled South Korea to abandon its program of nuclear-weapons development. In 1976 and again in 1987, partly under pressure from the People’s Republic of China, the United States had forced Taiwan to abandon clandestine nuclear weapons programs. Satellite images indicating an impending South African nuclear test that the Soviet Union passed to the United States for timely action in 1977 led to intense U.S. diplomatic pressure that delayed the South African nuclear weapons program by several years.” —Richard Rhodes, The Twilight of the Bombs: Recent Challenges, New Dangers, and the Prospects for a World Without Nuclear Weapons (2010), p. 5. There have been a variety of treaties between countries which already have nuclear weapons or which might acquire them, for the purpose of limiting or ending nuclear tests, and for the purpose of reducing the number of nuclear weapons and—supposedly—eventually eliminating them entirely. Overall, these treaties have been of only modest help in lessening the threats that nuclear weapons will eventually be used in new regional or world wars during the horrendously dangerous capitalist era. The basic problem is that the major nuclear powers are all imperialist countries which, either singly or in collusion with others of their kind, seek to exploit the people of the world at the point of a nuclear “gun”. • The Threshold Test Ban Treaty (TTBT). A proposed limitation on the size of even underground nuclear tests to no more than the equivalent of 150 kilotons of TNT. This treaty was broached in 1974 and immediately signed by the Soviet Union. The U.S., however, generally the more aggressive of the two imperialist superpowers during the Cold War, did not ratify it until 1990. A severe period of climate change, lasting from many months to a number of years, caused by a imperialist nuclear war in which massive amounts of smoke, soot and other fine particles enter the upper atmosphere (especially the stratosphere) and block much of the radiation from the Sun from reaching the Earth. This could have the effect of destroying crops and vegetation in general, along with sudden freezing temperature drops, and thus also killing off large numbers of animals. It is quite possible that a nuclear winter resulting from a major thermonuclear war could kill most or all of the human beings who escape death from the original explosions and radiation, even if they are on continents far away from where the bombs fall. However, since there has not (yet) been any massive nuclear war of this sort it is not completely clear how severe a nuclear winter might be in that situation. The fires which were set to around 600 oil wells by the retreating Iraqi army in 1991 (when the U.S. imperialists invaded the country) produced a lot of smoke, but little of this reached the stratosphere, and the climate change in the area was not as serious or as long term as some models at the time predicted. On the other hand there do now seem to be very good reasons, which are incorporated into more sophisticated climatic models, to expect that thousands of nuclear weapons going off around the world are much more likely to put massive amounts of soot into the stratosphere, and to therefore cause long-lasting and extremely catastrophic results—perhaps including the complete extinction of humanity.